Sometimes there's a stuffed animal or doll that makes it past the first few initial days of play. 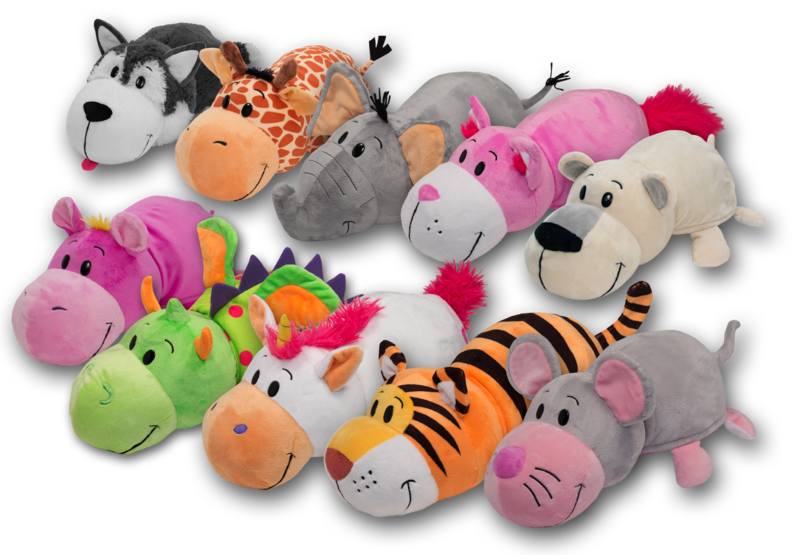 FlipaZoo plush toys are darling and bring an added touch of fun to ordinary stuffed animals. The snuggable, huggable animal pals transform from one animal to another and then back again – making every FlipaZoo twice as nice. With the new line’s patented one-of-a-kind “easy flip” designs, little ones can simply hold their favorite two-sided FlipaZoo friend, “flip” its soft back, and instantly reveal a totally new FlipaZoo! It's like having two stuffed animals in one. The adorable new FlipaZoo collection features more than a dozen stand-out characters, including the Unicorn/Dragon I received. The FlipaZoo assortment is available at Walmart stores nationwide and at FlipaZoo.com Consumers who purchase any FlipaZoo on the official website will receive a free "Little Flipzee" for pocket-size flipping fun. It takes no time at all to "flip" from one animal to another; It literally takes just seconds. The plush is made with quality material and, other than the tag that can be detached, I don't see any material or pieces that would pose a choking hazard. The FlipaZoo animals are made in such a way that you can't see the other animal disguised underneath unless you flip the body over. People tend to have misgivings about some "As Seen on TV" products but FlipaZoo is one that I think will be popular with the kids and is worth purchasing for children that like stuffed animals. One person will win a FlipaZoo (design randomly selected by sponsor). One of my favorite zoo animals is the giraffe! I was always fascinated with Zebras whenever I visited a Zoo. That is one of my favorites. I love the big cats, especially tigers! My favorite zoo animals are the lions. My favorite zoo animal is the monkeys. I love watching how human like they are with their mannerisms. I love elephants and polar bears. Monkeys and Elephants are my favorite! Penguins are always my favorite animals to watch at the zoo! I love the polar bears! We went to the zoo last night and saw one of my favorites: her name is Olive the sloth. And she actually woke up, scratched her face, and went back to sleep. My kids were shouting, "She's moving! She's really moving!" because usually, she does not. I like Zebra's at the zoo. I always like watching the bears and flamingos. The giraffe is my fave. They're leisurely in their walk and elegant to watch. Thanks for hosting! I always love the giraffe's! I like penguins and zebras. I always loved the zoo, I am now however very conflicted about them. Except for places like The Popcorn Zoo in Southern Jersey, they really do good work and are a lot of fun to visit. I love the Giant Panda even though they are not at our local zoo. I love the little dog! I have always loved tigers! I've always been a big fan of tigers. azoo! I think my favorite zoo animals would be the monkeys!!! I like to see the giraffes when I visit the zoo. I always spend a lot of time in the primates area-monkeys and gorillas fascinate me. I always enjoy the monkeys, but our little guy is fascinated with elephants! My son loves giraffes and elephants. One of my favorite zoo animals in the wolf. My favorite animals to see at our zoo are the gibbon monkeys. I love elephants and giraffes. It would be hard to choose between them. I love seeing the peacocks and the giraffes! My favorite zoo animal is the hippo. I love seeing the giraffes at the zoo! We were just at the zoo and the kids really enjoyed feeding the giraffes some lettuce leaves, it was fun watching the monkeys too. I love elephants and jaguars! I love the primates, all of them! I love watching them play! My favorite zoo animals are otters and snow leopards. One of my favorite zoo animals is the gorilla. I would like the Cat that turns into a mouse one. My favorite zoo animals are tigers. I love the Lions and tigers!! I love hippos and all monkeys and apes! I love the penguins best because they are so active and interesting and seem to like looking at the people -- they come right up to the window to stare back. I was excited when our zoo got koalas, but all they do is sleep all day, so they're kind of a bust -- it's like looking at a wadded-up brown bathrobe in a tree. Giraffes are one of my favorite zoo animals. my favorite zoo animal is a lion. the king of the jungle. My favorite is the elephant. They are such beautiful animals. Being an active mommy online, I'm sure you are familiar with the term dragon/unicorn. My little girl was a dragon when she was a baby with reflux, but now she is a unicorn, so I would love to have the dragon/unicorn. They are all cute, though, & it would be a fun collection for my girls to share. I love the giraffes and elephants. I love foxes and wolves. I love watching the bears and flamingos. i love seeing the monkies at the zoo. My favorite zoo animal is the giraffe. Their long necks look like they could reach the sky. I really enjoy the tigers the best! I like the regular Pandas and the red pandas (they are so cute and little and they sleep all the time). I like the bears. We have a nature center close by and love seeing the black bear. I like the elephants and gorillas..
Tigers and pandas are my favorite! I love the Leopards and Lions.